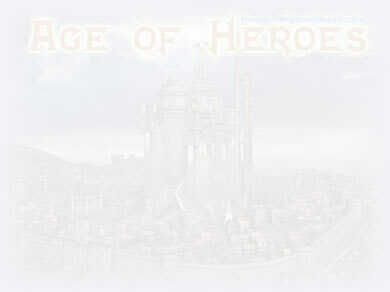 Age of Heroes and Heroes Community are copyrighted �99-2019 Valera Koltsov. Text, images, music, maps, files and scripts found on this web site may not be copied or reproduced without his permission. Unauthorised reproduction of copyrighted material is illegal in all countries and violates policies of every web hosting company. Offenders will be prosecuted. Heroes of Might and Magic: A Strategic Quest, Heroes of Might and Magic 2 (II): The Succession Wars, Heroes of Might and Magic 3 (III): Restoration of Erathia, Heroes Chronicles, Heroes of Might and Magic 4 (IV), Heroes of Might and Magic 5 (V), Might and Magic Heroes 6 (VI), and Might and Magic computer game series, including all related content and expansion packs, are registered trademarks and intellectual property of UbiSoft Entertainment, all rights reserved. Ubisoft Entertainment does not own or maintain this web site, and disclaims any obligation, responsibility and/or liability with respect to any content or accuracy of information contained on this web site.